Not everyone finds lens filters necessary, especially in this increasingly digital age. However, many photographers, especially those who have a particular interest in landscape and other natural photography, still love the way lens filters can enhance colour in their images and make difficult light conditions a lot more manageable. Filters are useful in a wide range of situations and proper use of them can add a valuable dimension to your photography. The graphic below aims to demystify lens filters and give you a handy guide to when and where to use the appropriate ones. Whether you are interested in travel photography, sports photography or you would like to try your hand at a range of disciplines, you will find various filters mentioned below useful. For more great photography tips, including a fantastic cheat sheet for manual photographers, visit the photography section of The Studio. Despite the modern ease of digital post-production, the practice of using lens filters is very much alive. From managing difficult light conditions to creating certain moods – there’s nothing like capturing the perfect shot, right there and then. Filters to your camera are what sunglasses are to your eyes. But just as sunglasses distort your vision indoors, using a filter in the wrong situation can ruin your shot – so it’s important you know your stuff. Any Protects your lens from dust, dirt, fingerprints, moisture and scratches. Any When using SLR cameras UV can interfere with photo quality – appearing as a haze. Modern DSLR cameras have an inbuilt filter, in which case UV filters are used as another form of protection. Any Used to reduce reflections, increase contrast and enhance colours. The effects from polarizing filters cannot be replicated during post-production. Landscape and flash photography Effective for avoiding overexposure when large apertures are required. Ideal for capturing long exposures. (Example of how these filters attach) Landscape photography Used to balance exposure in high contrast situations between bright skies and dark landscapes. Best used when photographing flat horizons – such as an ocean view. Landscape photography Used in high contrast situations with uneven landscapes – such as mountain ranges. Avoids over and underexposure. Landscape photography Transitions from a dark centre to a lighter edge. This allows for photographs shot against the sun to be captured as they appear in person – without overexposure. Any Suitable for colour correcting, subtracting, blocking and boosting. Perfect for film photographers wanting to correct or add colour to a shot. Any For correcting unrealistic tints of colour, or to add one. Changes the mood and atmosphere of a photo by altering the white balance. Macro photography Allows for close-up shots by shortening the minimum focussing length. Lenses come in a range of strengths also known as dioptres, with higher numbers indicating a closer focal point. yellow filter | no filter Any Multiple filters are used to enhance B&W images. Red, orange, green and yellow filters are used bring out certain monochrome shades. The digital darkroom can’t do everything, so know what filters to use and when. Just remember – practise and experimentation are your keys to success. very nice! 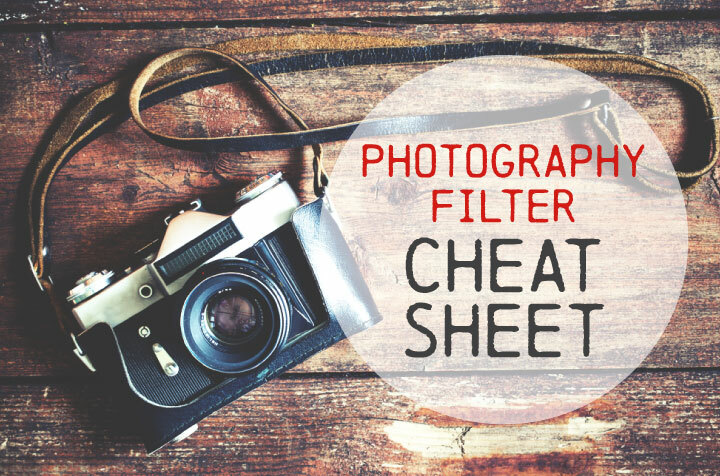 Will there be a downloadable PDF just like the manual photographer’s cheat sheet? Your polarizer slide is incorrect about how they are used. Cameras with TTL metering (whether digital or film) can’t correctly analyze polarized light, so a circular polarizer (which essentially de-polarizes the light after filtering) must be used. However, in situations that benefit form TWO polarizers, the second (forward) filter needs to be linear. Older, non-electronic cameras can use linear polarizers exclusively. Some of these are a little off – for a polarizing filter – you didn’t use a linear with film and circular with digital. It’s just rare to find non-rotating lenses with digital cameras. Why would you use warming and cooling filters with a digital camera? All you’re doing is changing the temperature of the light (or adjusting the white balance). Buying a filter to do what you can do in 5 seconds in-camera seems to be wasted money. You’re absolutely right that much of these can’t be duplicated in post-processing but some of these filters are relics of the film era. Thanks for putting this together – the visuals are a great help. That was really helpful info. I am a newbie in photography and have fallen in love with the art. The more information out there the better for us new ones. I want to say thank you for the help and information. I am marking your page in my blog.